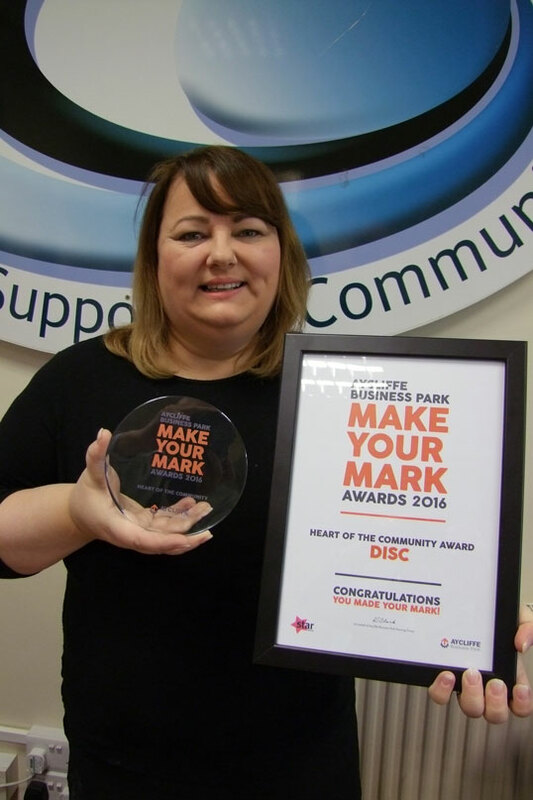 DISC were recently awarded “Heart of the Community” at Newton Aycliffe Business Park "Make Your Mark" awards. The annual "Make Your Mark" awards celebrate the collective achievements of companies on Aycliffe Business Park and the “Heart of the Community” award celebrates excellence in corporate, social and ethical activity. Developing Initiatives Supporting Communities (DISC) is an independent charity working across the North of England to combat deprivation and promote social inclusion, won the award for work undertaken by its education service which provides tailored support programmes to students that was recently recognised as Grade 1 Outstanding by Ofsted. Durham County Councillor John Clare who was one of the judges said: “As one of the judges, I was impressed by the depth and the sheer scale of the work DISC is doing with young people. Lindsey Smith, Senior Team Leader at the charity (pictured left) , said: “It was a very proud moment when the award was announced. This was the first year we have entered the Make Your Mark awards, and to be shortlisted alongside some much larger organisations was an achievement in itself; to win was simply outstanding! DISC’s Chief Executive Officer Paul Townsley said: “Achieving the Heart of the Community Award is another affirmation of the excellent work undertaken by DISC and I congratulate everyone in the Education Services team.